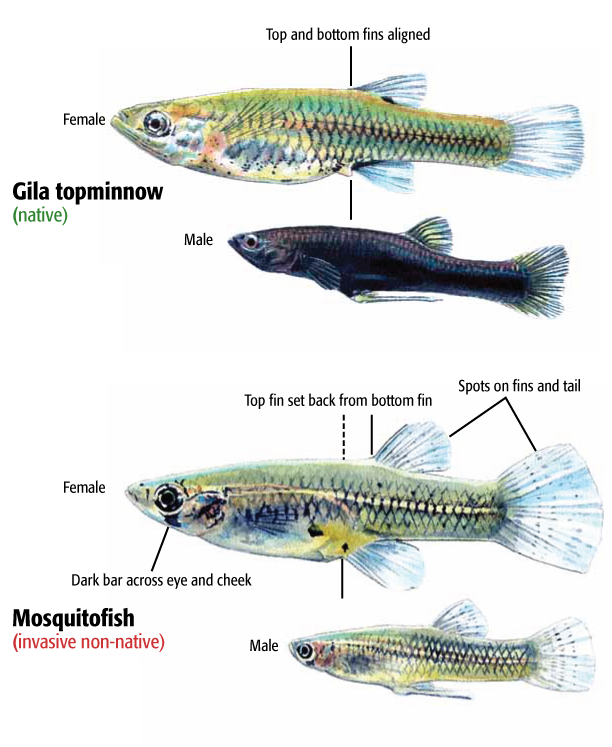 Gila topminnow and Mosquitofish are difficult to tell apart. Look for the distinctively dark male topminnows tirelessly chasing the larger females around in the shallows during warm months. In mosquitofish, the males are the same color as the females. With a magnifying glass, the mosquitofish have dark bars across their eyes and cheeks and the upper fins are staggered with the top finn further back on the fish than the bottom. Topminnow fins aline top and bottom. One final distinction are the tiny black dots on the fins of mosquitofish are absent on our native topminnow.